Meat: steak wrapped with pancetta (or bacon) , sausages on skewers, you can substitute pork, lamb, shrimp - any cut of your choice for grilling. In a mortar & pestle add garlic, chili flakes, zest of 1/2 lemon, coarse sea salt, herbs and mash together with enough olive oil to make a paste. Quarter sausages and set aside as they have already been seasoned. Cut steak into chunks slightly larger than the sausages and toss with the herb paste and wrap with a slice of the pancetta. 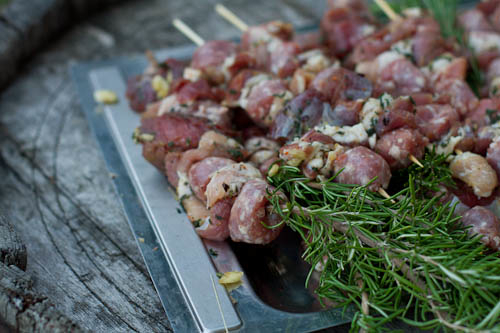 Fill your skewers alternating steak and sausage. Grill! Please note: if you are using beef, you want it to finish cooking at medium rare and your pork fully cooked. In this case cut the beef slightly larger than the sausages. Adjust your sizes/cuts to allow for proper cooking time. Nothing says summer like a barbecue on a hot summer night! 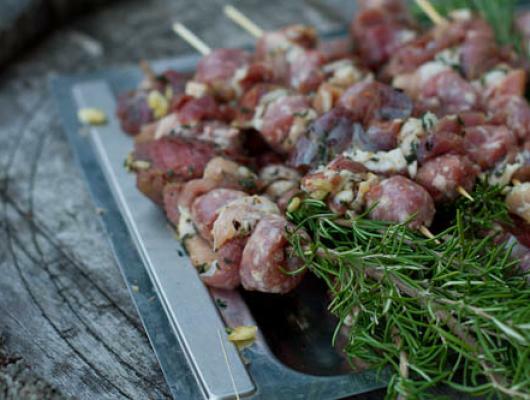 Fragrant rosemary skewers packed with filets of steak wrapped in thinly sliced pancetta and fresh sausages grilled over an open fire...my oh my! This is a barbecue Italian-style with spiedini or skewers with anything from fish to meat and/or vegetables. Tonight at the farmhouse it's grilled meat spiedini all the way, with grilled polenta & a garden salad.